I don't know about you, but the last thing I want to eat is genetically modified food. California Proposition 37 is a ballot initiative for the November election that would require labeling of food made with genetically modified ingredients. 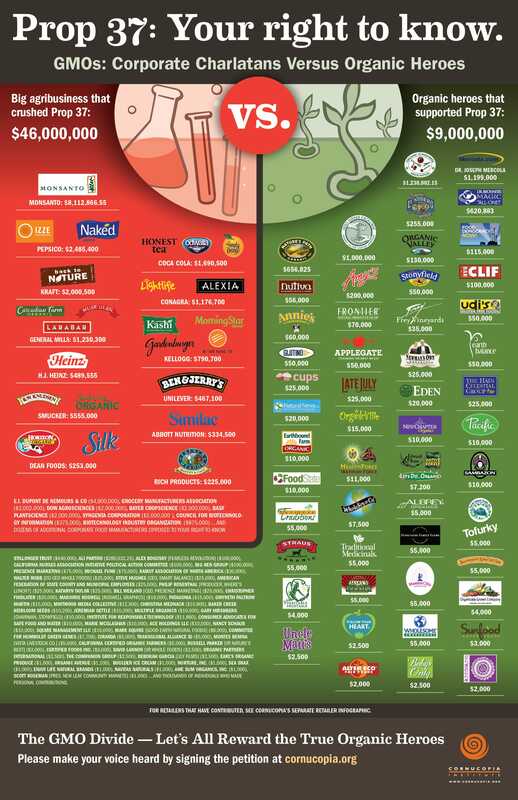 If this passes in CA, GMO labeling may be seen nationwide. If you have time, please take a look at the petition & sign it. The public list of financial backing for & against the initiative is very interesting. Tonight I made a batch of oatmeal for the next two mornings so that I won’t have to make breakfast before work. 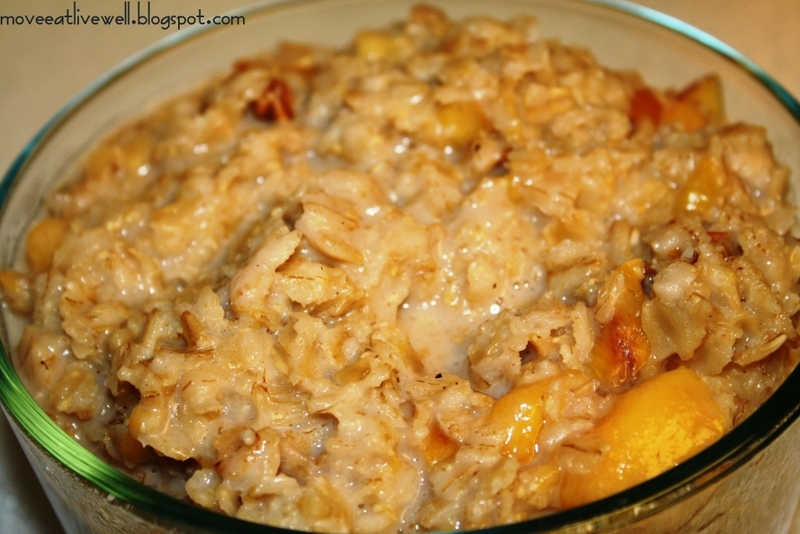 I had a very ripe peach & a brown-speckled banana, so I made this easy, healthy oatmeal. It’s been a while since I’ve posted, & I hope you’ll like what I came up with tonight. I made an easy salad with summer vegetables (some from my sister-in-law’s garden) that was a quick, light, & perfect for a hot summer night. If you are a cancer patient undergoing treatment, please see the disclaimer at the end of this article. I received a nice note yesterday from Tee asking how I'm doing. 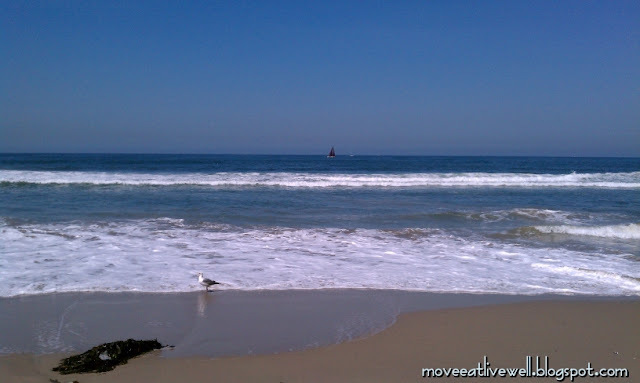 It's been a while since I've posted because I've been really busy with going through escrow & organizing a move. Once I'm settled into my new place, I'll post recipes again! 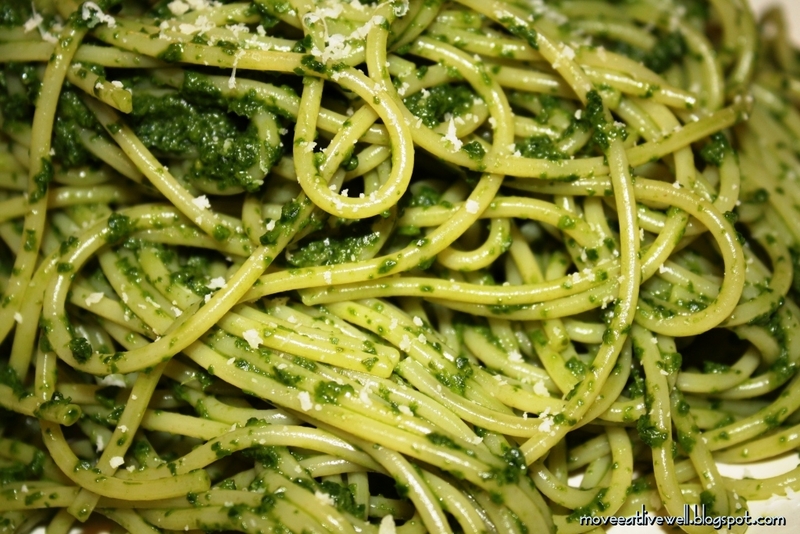 This week I made Peruvian green spaghetti, an easy, healthy, quick dinner perfect for hot summer nights. I made this from memory, & it’s pretty difficult to mess it up. Serve it as a side or main dish with pasta of your choice. This sauce is also great on bread. After a 2-mile walk, I did this 300 rep workout. You may have noticed that I like workouts that incorporate balance. I didn't time myself because I focused on perfect form rather than speed, but I think I completed 3 rounds in about 38 minutes. If you want a more intense workout, do more rounds, add jump rope, &/or move as quickly as you can with good form. Make sure to warm-up & cool-down! After a 3-mile walk to the beach & back, I did this quick 180 rep workout. If you want a more intense workout, do more rounds, add jump rope, &/or move as quickly as you can with good form. I didn’t time myself, but I think I completed this in less than 15 minutes. Make sure to warm-up & cool-down! 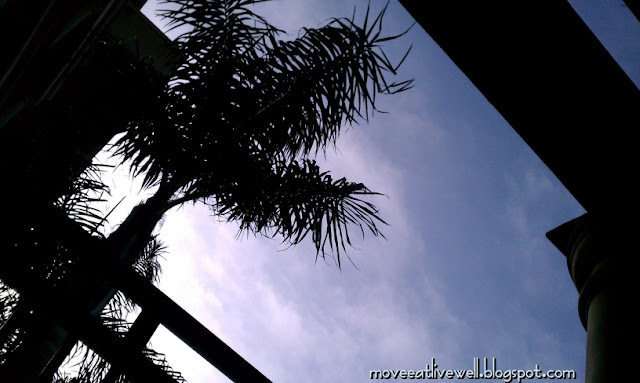 After a short walk, I did this quick workout which can be done anywhere. I only did 2 rounds because I was in a hurry. If you want to increase the intensity, add more rounds, jump rope, or convert the workout to HIIT (example: set your timer for 10 sec rest/50 sec work for 16 rounds = 16 min workout). Make sure to warm-up & cool-down! 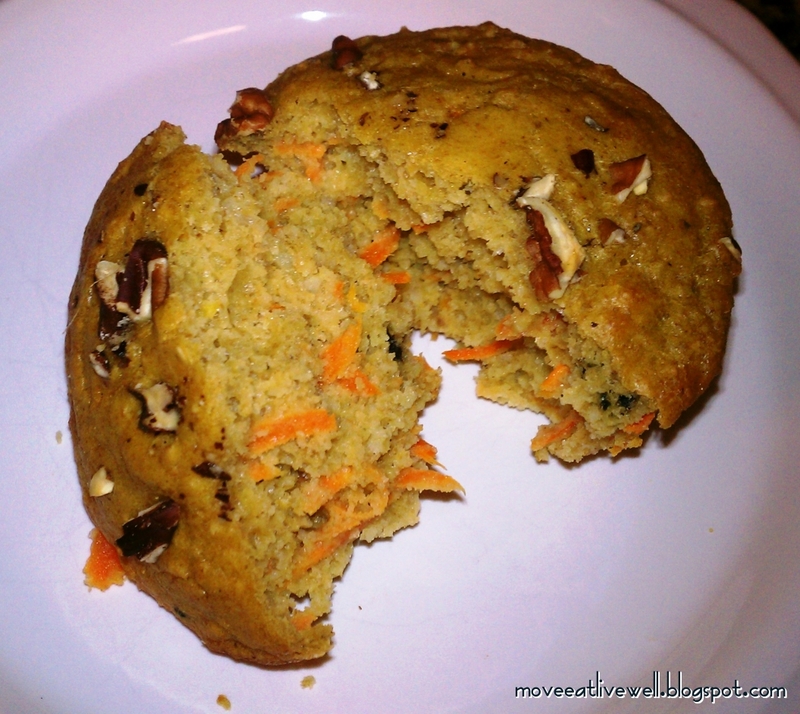 These little muffins are oil-free, packed with protein & beta carotene, & yummy! Have then for breakfast or a snack. The recipe was inspired by a recipe for carrot-pecan muffins in my Readers’ Digest Live Longer Cookbook. This recipe is NOT sweet, which makes it a great breakfast option. 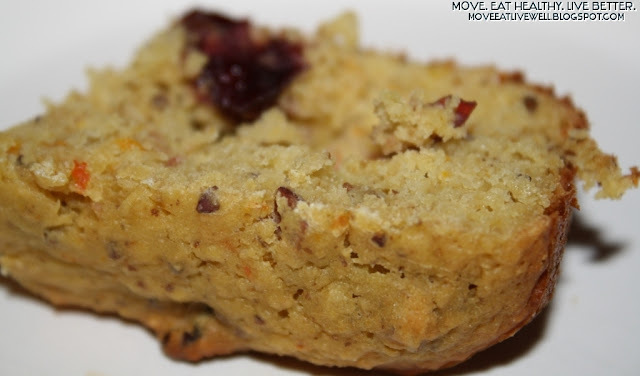 If you prefer a sweet muffin, use more brown sugar! This post probably won’t appeal to you unless you avoid eating tomatoes. Who the heck wouldn’t eat tomatoes?! Well, anyone with blood type B who follows the Blood Type Diet, or maybe someone who has an issue with tomatoes & their stomach. Or maybe you like the idea of a sauce made of two highly nutritious vegetables instead of one that tastes almost the same. Tonight I finally tried out tomato-less tomato sauce. I used a recipe posted on dadamo.com & one posted by a great cook, Donna Blankenship, as a basis for my sauce. I was very skeptical that carrots & beets could pass for tomato sauce, but I am now convinced! 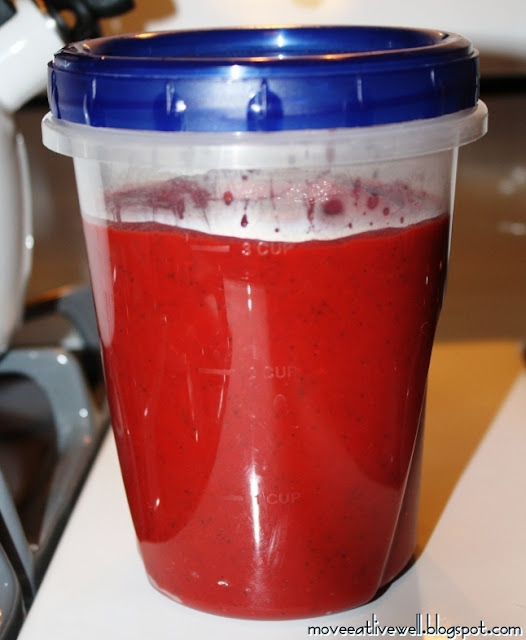 I made my sauce from scratch, but you can easily save time by using canned carrots &/or beets. The sauce will freeze well, so I made a double batch. Tonight I came up with a routine that used all of my favorite workout equipment. I kept the intensity low, but you can easily turn it into an inferno workout. Add jump rope, complete the workout as quickly as possible with excellent form, or change the format to HIIT (18 rounds 10sec rest/50sec work =18min). Make sure to warm up & cool-down! Here's a great equipment-free workout I did during my lunch break that you can do anywhere. I've been a bit fatigued the last few days, so tonight I made a up a rep-based workout & took my time completing it. To make it more challenging, complete the workout as quickly as you can with good form, add jump rope between exercises, &/or make the squats & dead-lifts harder by adding a jump. I rarely follow a recipe exactly as written, but today I am glad that I did (okay, my version is 2% different). 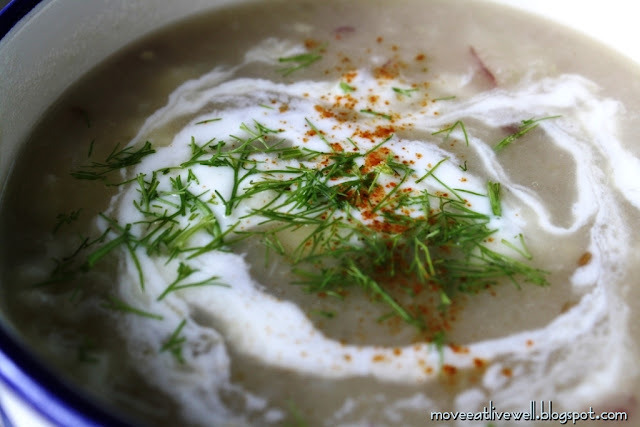 I made potato-fennel soup from The Moosewood Cookbook, & it is amazing! This filling soup is easy, tastes rich, & can be made without any dairy products if you prefer. This breakfast is so easy that I’m a little embarrassed to post it. Did you ever watch "Not Another Teen Movie"? Do you remember the scene where the the girl's artwork is revealed, & the masterpiece was a stick figure drawing? That's how I feel about this post! However, it’s delicious, filling, healthy, versatile, inexpensive, can be prepared ahead of time in bulk, & is great for rushed mornings. It was born out of laziness one morning. 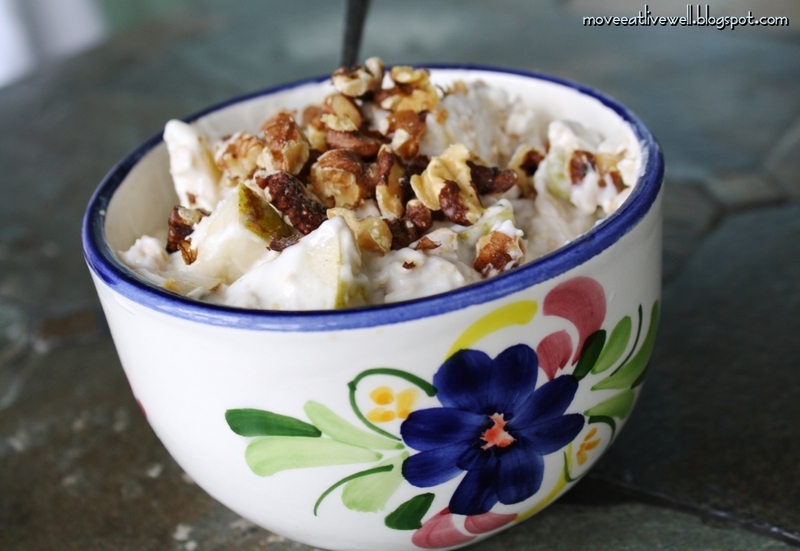 I mixed up a bowl of yogurt & pears, but when I went to add homemade granola, I was out! I decided to try adding raw oats & nuts (“deconstructed granola”). I really liked the combination, & have been making it frequently since. 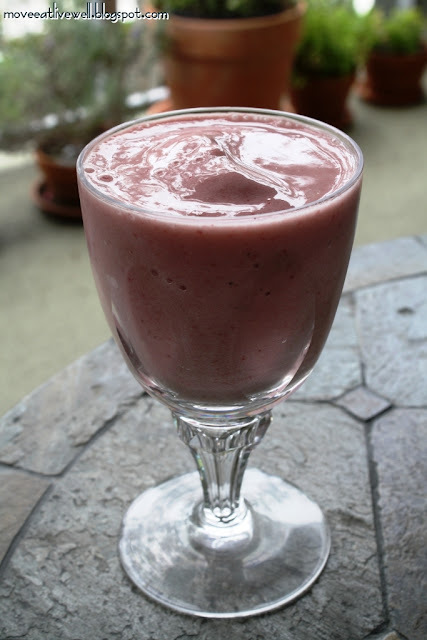 I use plain yogurt & do not add a sweetener since the fruit is sweet. 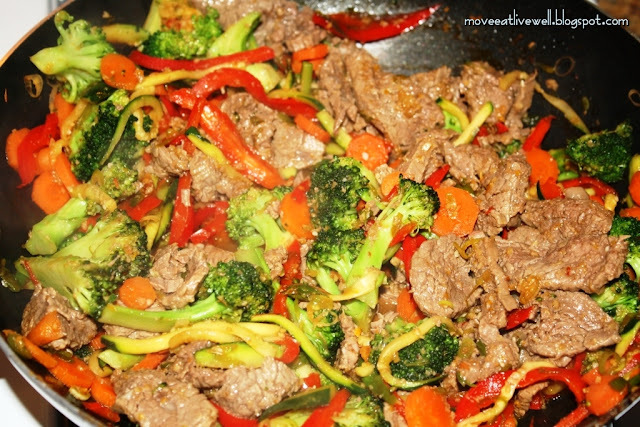 This orange ginger beef stir-fry is simple & delicious! We ate it for dinner over brown rice, & I have some packed for lunch tomorrow. Jewels’ fantastic fish marinade (The Family Chef) is one of my favorite recipes. 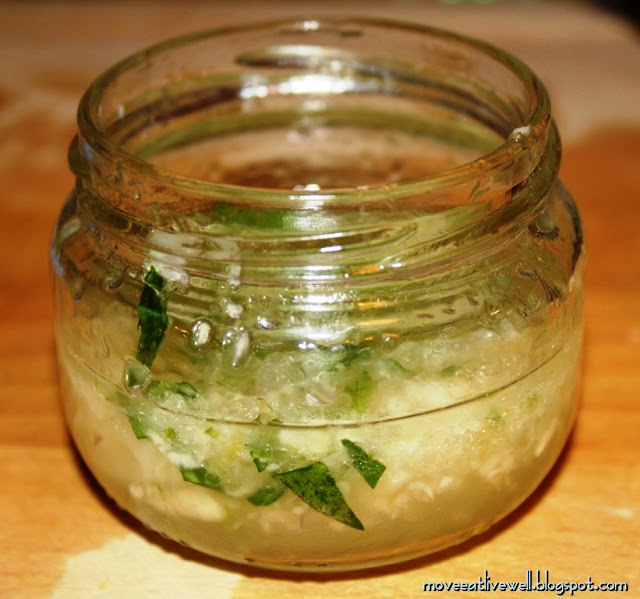 It is excellent with fish, mixed into quinoa or rice, & can be turned into a refreshing salad dressing. 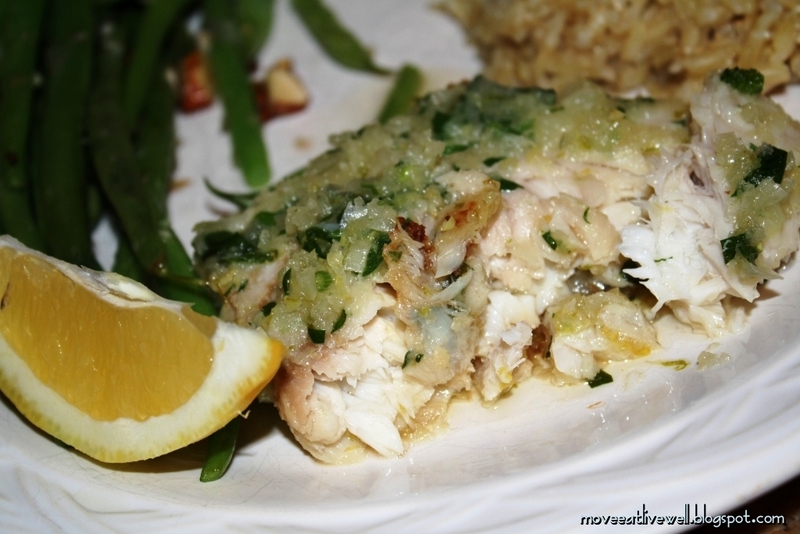 The meal in this post is halibut in Jewels’ marinade, which I served with brown rice & easy almond green beans. The marinade is tasty with all types of fish, so try it with your favorite. The salad dressing is described in a separate post. 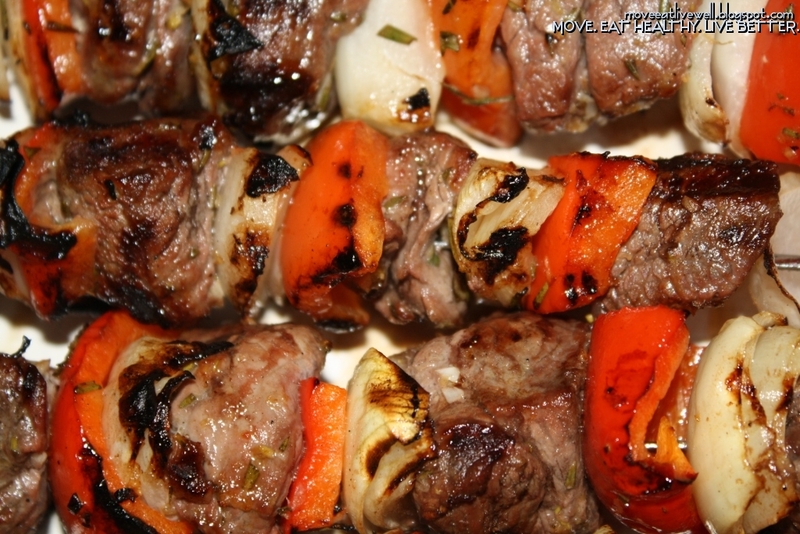 I hope you like this marinade as much as I do! The marinade will last for a few days. 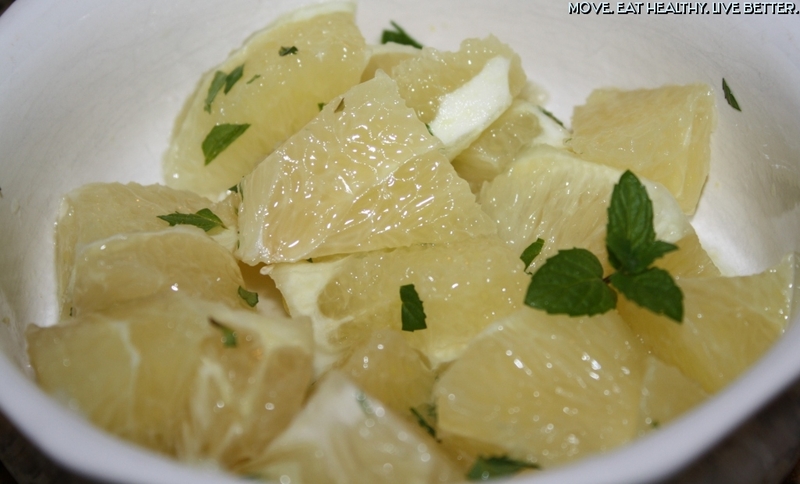 Jewels’ fantastic fish marinade (The Family Chef) is one of my favorite recipes. It is excellent with fish, mixed into quinoa or rice, & can be turned into a refreshing salad dressing. Tonight I made a new cabbage salad based off of a recipe I found on Epicurious. This cabbage salad is refreshing, healthy, & versatile. It can be eaten on its own, added to tacos, served on the side with fish, poultry, or red meat (cumin-lime grilled flank steak) like I ate for dinner, or served with rice & beans for a satisfying vegetarian meal. I only added dressing to the portion we ate tonight; store leftovers without dressing so that it doesn’t wilt. 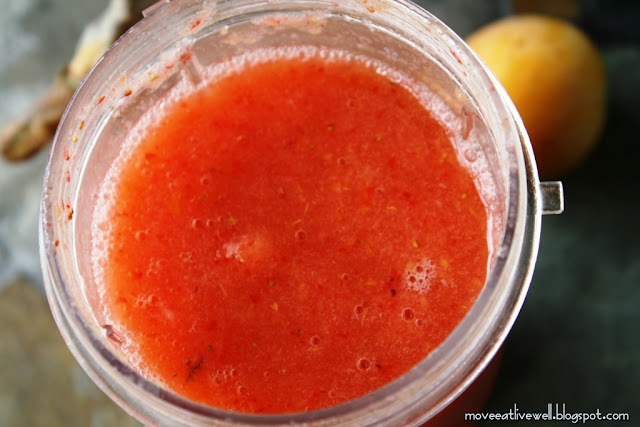 This is a very flexible recipe; experiment with ingredients to find your favorite combination. The next time I make this, I may add jicama & red cabbage. WHITE BEAN VEGAN BLONDIES: CCK'S GENIUS BLONDIES ARE GOOD! On that wonderful time-sucking website, Pinterest, I saw a recipe that I wanted to try. The first time I made Chocolate Covered Katie’s genius blondie bars, I did not think they were post-worthy. To be fair to Katie, I mutilated her recipe the first time. Today, I barely modified her recipe & they turned out much better. If you have not discovered Katie’s website yet, check it out! 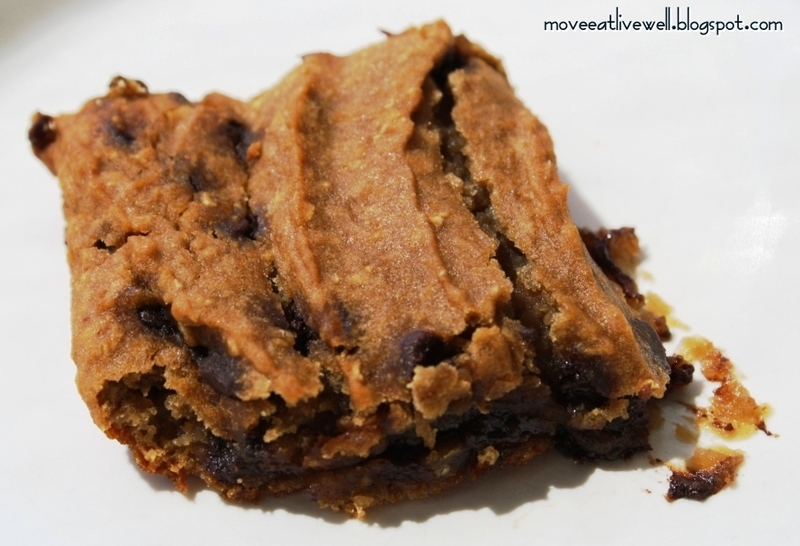 It is full of creative ways to eat chocolate in a sneakily healthy way. There are times I really don't want to go the grocery store, even if I'm running low on supplies; I call it a grocery store boycott. Sometimes the boycott is due to laziness, sometimes it is because I will be going out of town, & today it's because I woke up with a stiff neck. Grocery store boycotts force kitchen creativity. This morning I wanted to make my favorite breakfast, (oatmeal pancake) but I only had 1 egg, & didn't have bananas (if I don't have 2 eggs, I will use 1 egg & ½ banana). I did have a pear, so I tried that in place of a banana. The result was a tasty pear oatmeal pancake! 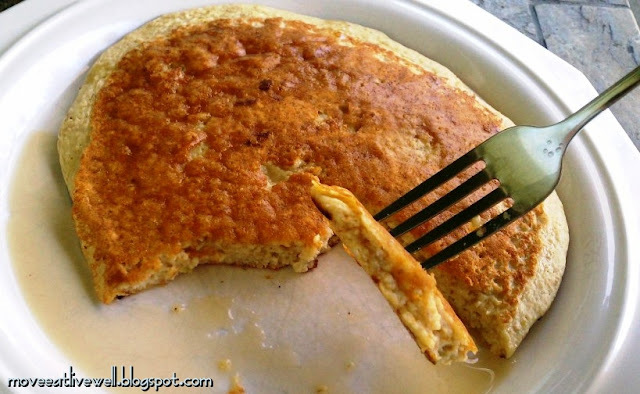 If you like oatmeal pancakes, try using ½ pear blended into the batter & omit one of the eggs. Here’s another at-home barefoot workout that I did tonight before Mad Men. I used equipment, but this can easily be an equipment free workout. This is great for balance! 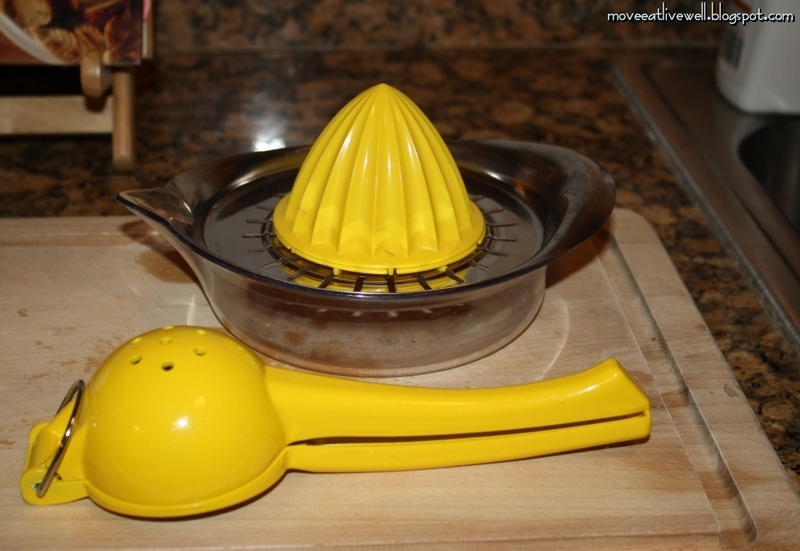 I don’t know about you, but my most used kitchen tools are simple & I love them: mortar & pestle, citrus squeezer, zester, chef knife, cutting board, & bowls. I was in the market for a new mini-food processor, & rarely does a new device make me as happy as my new Cuisinart mini food processor does. 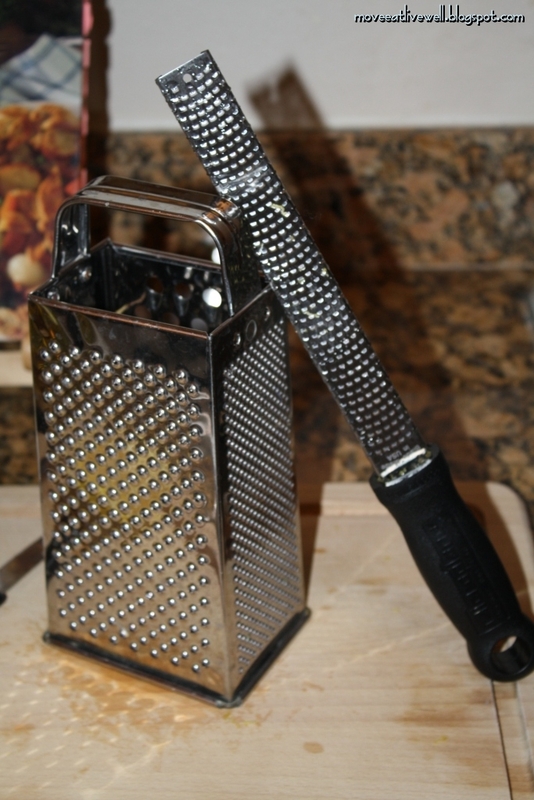 I have used a Magic Bullet for years, & it’s great, but my new mini food processor sees a lot more action these days. I’ve made bean dip, bean cookie batter, banana faux ice cream, oatmeal pancake batter, ground whole flaxseeds into flour, ground oatmeal into flour, chopped nuts, & I know that I will find more uses for it in the future. You can find this item in my store in the "Kitchen Tools" section. I love to cook with fresh herbs, but that can be pricey if you buy them at the market. If you grow your own, you can always have a fresh supply of delicious herbs on hand for cooking, making tea, or whatever you want to use them for. I live in an apartment, so I grow my herbs in pots on my balcony. If my kitchen had windows, I would probably grow them in the kitchen near the windows. If I lived in a house with a yard, I would grown them outside, too. 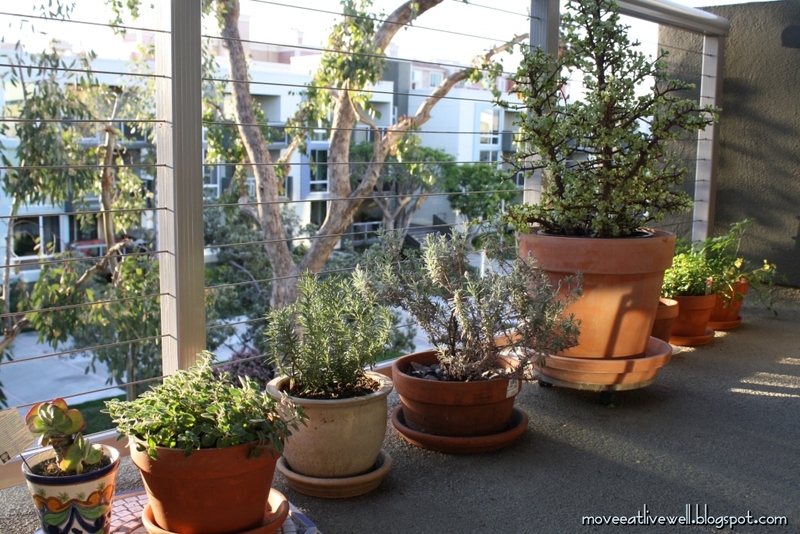 One day I might try to grow lettuce, onion, & garlic, but for now I'll stick with herbs. This is a 600 rep workout I did at home tonight, barefoot. I used equipment, but this can easily be done equipment-free. I did 3 rounds of a fixed number of reps, but you can convert it to an interval workout (set your timer for 10/50 sec x 24 rounds for 24 min workout). Today was cold & rainy: a perfect day for cooking! I made roasted beet salad, then decided to make navy bean soup using the beet greens. 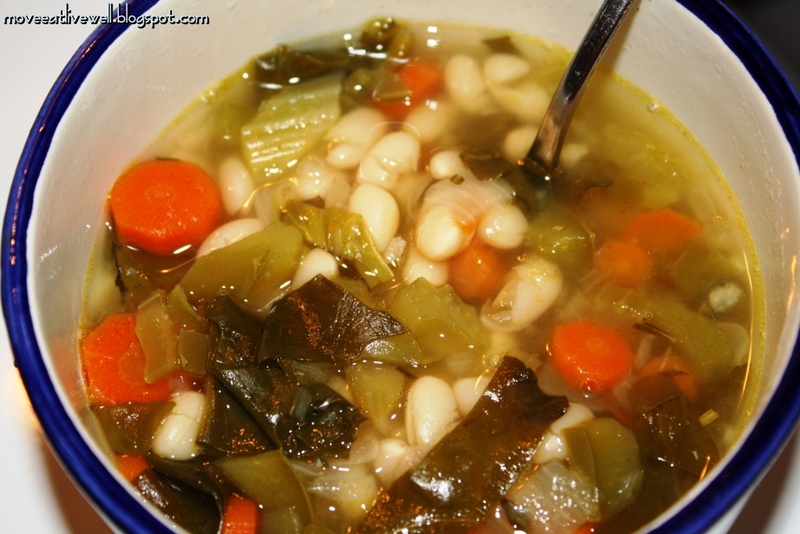 I have never had navy bean soup with ham in it, so I make a vegetarian version. If you prefer to use ham hocks, simply add them to this recipe. If not, enjoy my meat-free version. I REALLY miss Mexican food. Almost anything on a Mexican food restaurant menu has ingredients I’m avoiding. Tonight, I made up a dish that was easy, healthy, tasty, & satisfied my Mexican food craving. I hope you like it as much as I did! A few months ago I made cream of broccoli soup using sweet potato as a base rather than cream or milk after coming across a recipe on dadamo.com. I really liked the soup, even though it tasted different than the traditional version. Substitute regular potatoes or butternut squash if you do not like sweet potato. 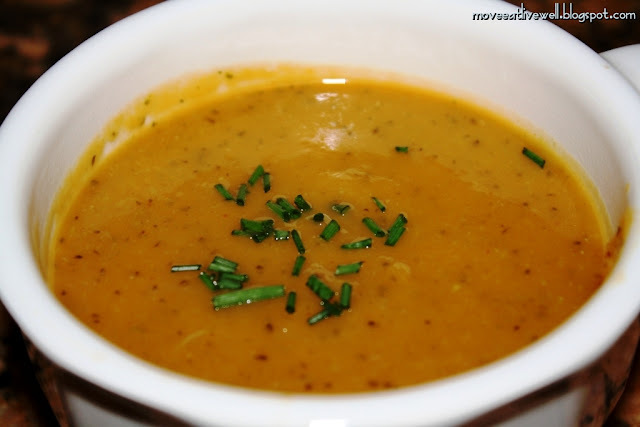 Cayenne pepper is especially good with slightly sweet things like sweet potatoes, but season the soup however you like! 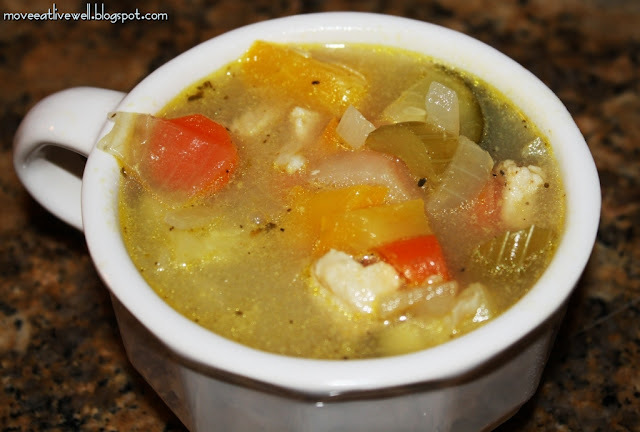 This recipe serves as a base for other cream of vegetable soups as well. Regular juicer. 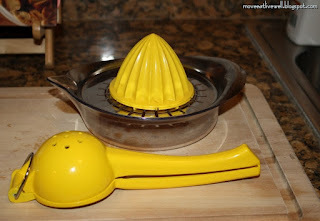 If you don’t have a juicer, you can squeeze the juice out by hand! 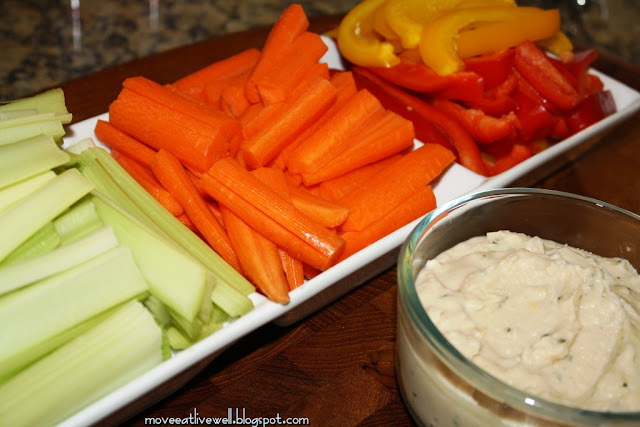 Garlic white bean dip is my go-to appetizer recipe. It is easy, healthy, & a great alternative to hummus or ranch-based dips. My recipe is based on one from The Abs Diet. Here's another recipe that doesn't belong on a healthy eating website. However, moderation is good, & if you are going to eat sweets, it may as well be homemade so you can control the quality of your ingredients. Thanksgiving is my favorite holiday. It brings family, friends, & great food together without being overly commercial like many other holidays. 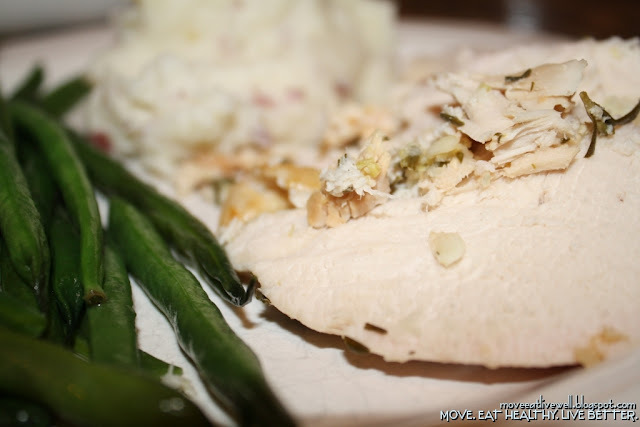 Thanksgiving dinner can be delicious, healthy, gluten-free, easy, & enjoyed year-round. I had a turkey breast half in the freezer, & red potatoes & green beans in my crisper drawer so I chose to make Thanksgiving dinner last night even though it's March. This meal isn’t something to make on a hectic weekday night, but is great for the weekend, a day off, for company, or obviously holidays. 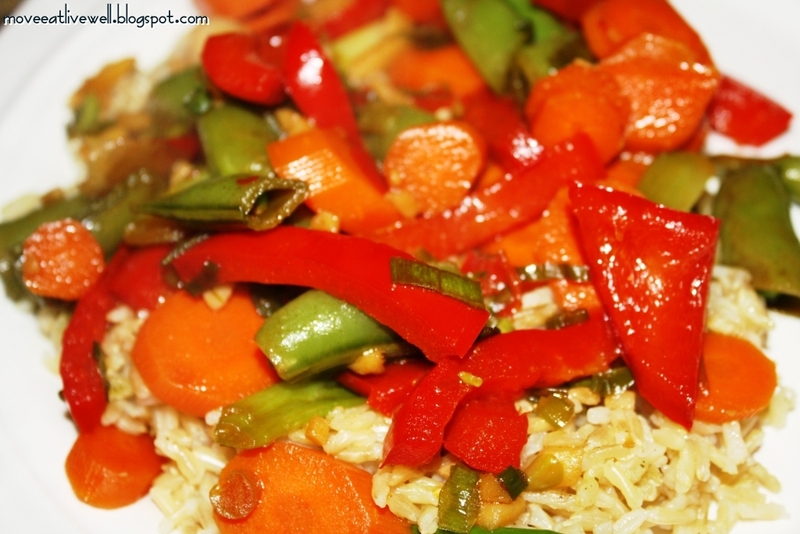 Another benefit is that it may provide 1-2 nights of leftovers, depending on how much you cook. If you've never roasted turkey before & if the idea scares you, this recipe is a great place to try it out! Of all of the new foods I've introduced to my diet since eating according to my blood type, lamb is what I have been most apprehensive about. Tonight I cooked it for the first time; both my husband & I loved it! 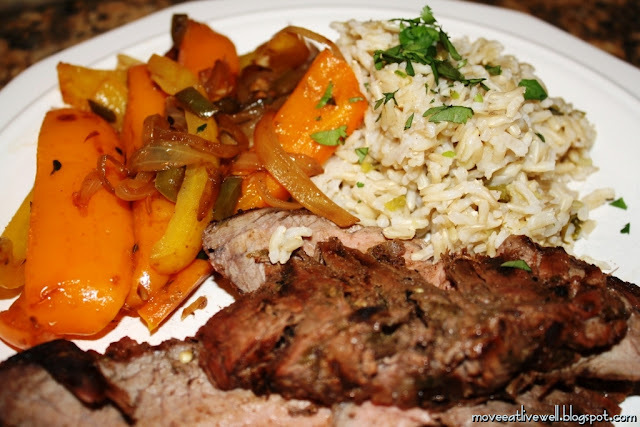 We ate our lamb kabobs with brown rice. 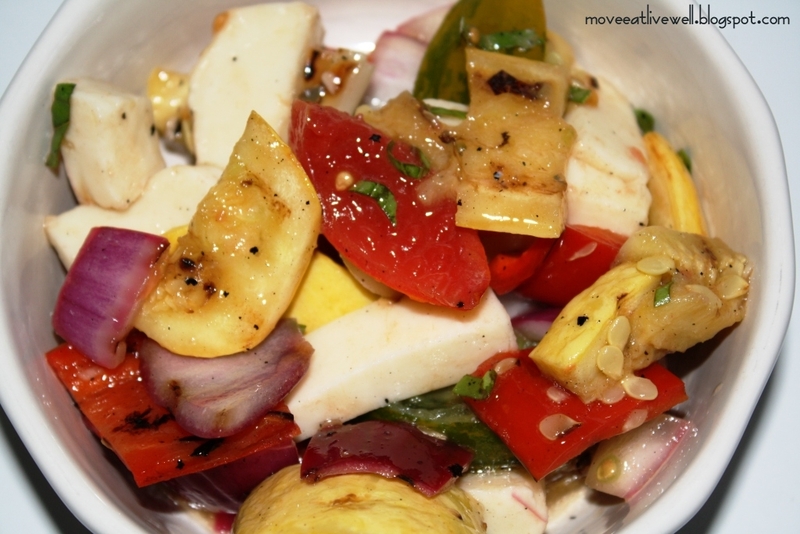 This would make a delicious, easy meal for entertaining, especially in the summertime. My recipe is a modification of this Bon Appetit recipe. If you have visited my site before, you may have noticed that many of my recipes include tangerines. I have a grandmother who loves to send me home with juicy tangerines & grapefruit from her trees. This morning I made bread similar to last week’s lemon-ginger walnut bread. Today’s version is tangerine with cranberry & pecans. 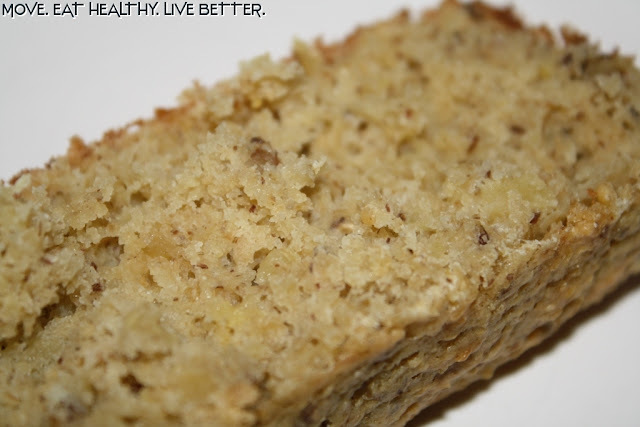 Quinoa flour & yogurt add protein to the bread, & ground flaxseed adds heart-healthy omega-3 fatty acids. 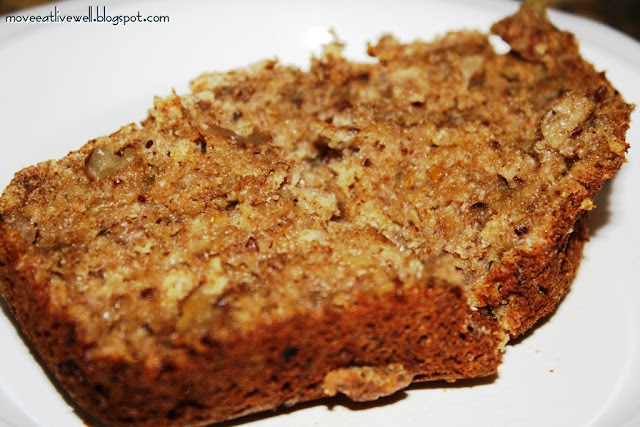 I used quinoa flour, oat bran, & spelt flour in this recipe, but if you don’t like or have those, use whatever you have. Quinoa flour adds protein, but also a different flavor; if you do not like quinoa, I recommend using another type of flour. 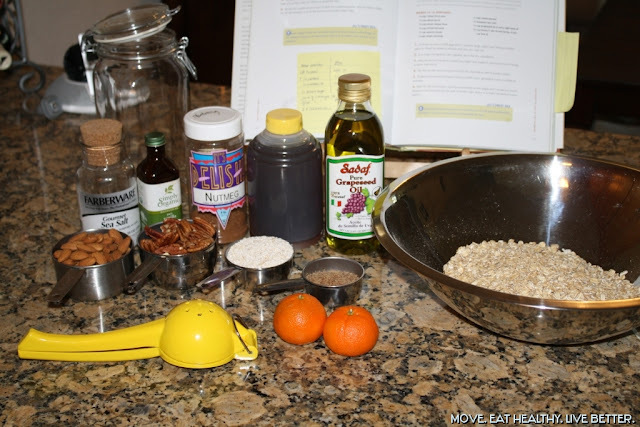 If you haven't tried quinoa yet, try it in a dish before buying flour for this recipe. Quinoa flour is expensive! This bread is not very sweet, which is why I like it as breakfast bread. If you prefer sweeter bread, add sugar (½ cup) to the dry ingredient mixture, or make a glaze. I never like to grocery shop, but I love having a kitchen full of fresh produce. Today, almost all of the produce I bought was organic, & the prices were only about 10 cents more per pound than their non-organic twins! Golden beets were especially well priced, & I turned them into a delicious salad tonight. My recipe is derived from The New Moosewood Cookbook’s Odessa Beets. 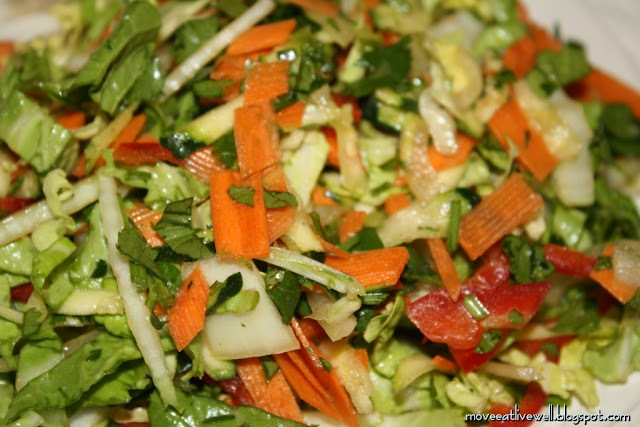 This may top cabbage salad as a personal favorite….I never thought that was possible! The flavors of this salad combine wonderfully, & this vegan salad contains zero added oil. HOW AM I SUPPOSED TO WORKOUT WHEN I DON’T HAVE ENOUGH TIME?! Does this look familiar? This post is lightly modified from a section of another post on my site (Bodyrock.tv Beginner Guide). Do you have any tips or suggestions to help others make fitness part of a maxed-out schedule? What works for you? Please share in the comments below! When the subject of working out comes up, there are certain phrases repeated so often that it’s like a script is being read each time. One of these scripts includes the words, “I don’t have enough time to workout.” I get it. I’m busy, & I don’t even have kids. Between work, cooking, cleaning, commuting 2 hours a day, studying, socializing, being a good wife/new mother/daughter/friend & trying to keep up with my favorite shows (Dexter! 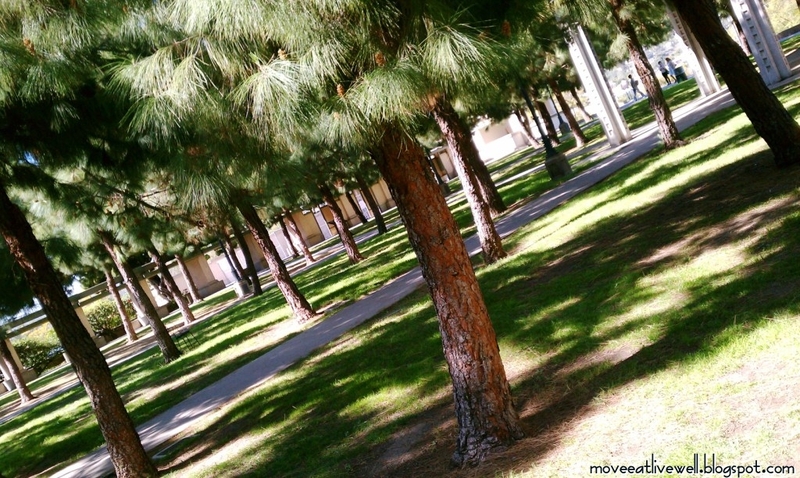 ), it can be a challenge to carve out an hour a day to move. Melissa Power has some great workouts! This one is only 24 minutes, & is equipment free. 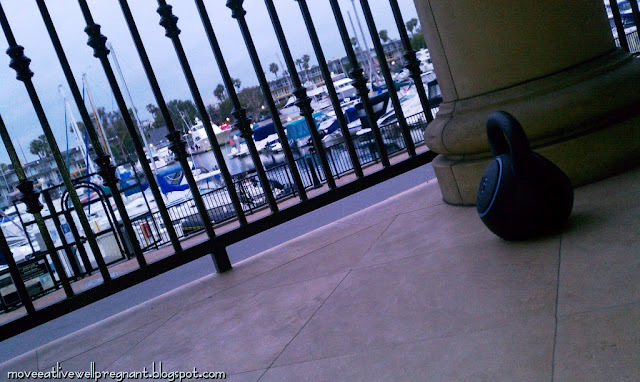 Take it on vacation with you, to the gym, or to the park! I thought this was a perfect lunchtime workout. If you don't have an interval timer, do a certain number of reps for each move. If you can’t afford to buy a Gymboss, there are free options! Do you have a smart phone? iTunes & Android markets each have great interval timer apps for free. This weekend I wanted to make lemon ginger muffins, but was out of muffin cup liners & was too lazy to make parchment paper liners. Instead, I converted a lemon tea cake recipe from The How-To Book of Healthy Cooking into lemon-ginger-walnut bread. It was really good! I used spelt* & oat flour instead of all purpose flour & whole wheat flour. I also did not make a sweet glaze to top this bread. After the bread recipe, there is a glaze recipe should you choose to make glaze. *Haven't heard of Spelt? See the end of this post for a description of the grain. 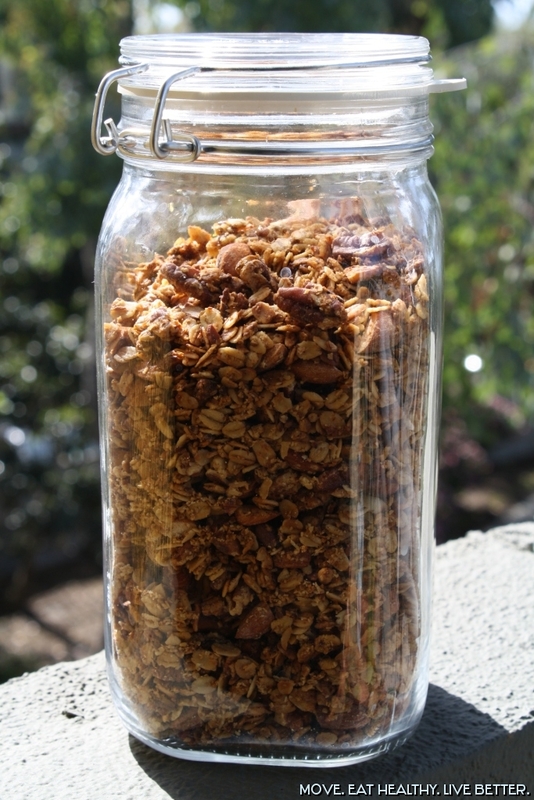 Granola is so easy to make, I often wonder why anyone ever buys it pre-made. I make a modified version of "the absolute best healthy granola" recipe from The Family Chef. 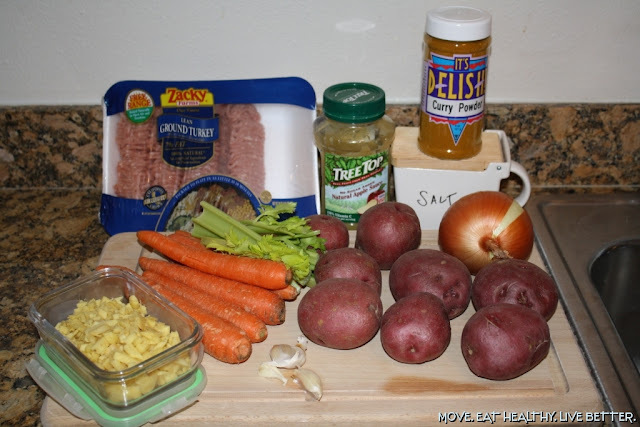 See the "More" section below for substitution ideas & serving suggestions. This can be made gluten-free if gluten-free oats are used. My version is gluten-free. 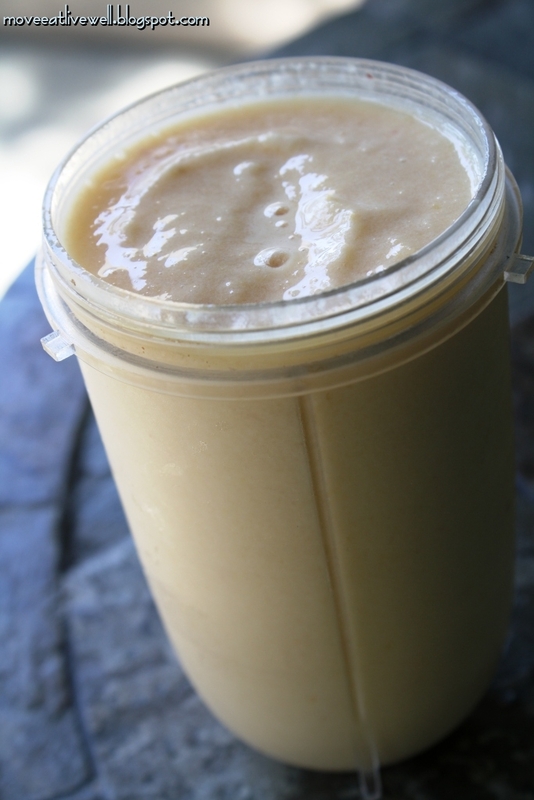 The first time I ever had ginger syrup was when I made ginger gelato last November. The recipe called for ginger pieces simmered in simple syrup for an hour. The pieces went into the gelato, & the sweet/spicy ginger-infused syrup was left over. I used it on pancakes, in oatmeal, in green tea, & with plain yogurt with fruit. Now, if I have ginger root left over from preparing a meal, I make ginger syrup. Ginger syrup can be used to make easy ginger ale, & the pieces can be used in baking (for example, Lemon-ginger walnut bread), in granola, making ice cream, or as a simple treat. 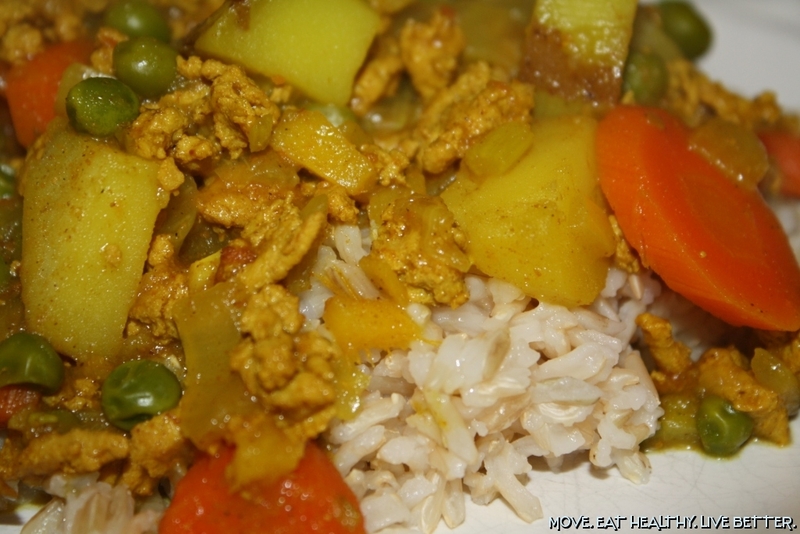 I used to love yellow curry with potato, carrot, & chicken from Thai restaurants. 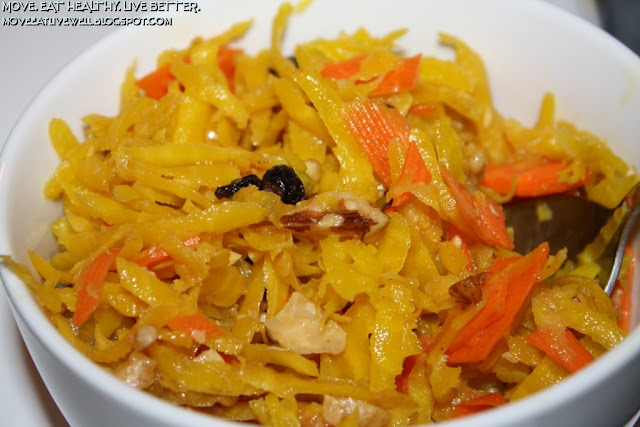 A while ago my coworker described a simple meal her mother-in-law makes which tastes similar to my favorite Thai dish, but doesn't have coconut or chicken. I made it from memory for dinner tonight with ground turkey. If you prefer chicken, roasted turkey, tofu, or no meat at all, you can use my recipe as a starting point. If you don't have the exact ingredients or quantities, use what you have; this is a very flexible recipe. Tonight I did a rep-based workout made up by a Bodyrocker. It can be done using a dumbbell, kettleball, or weight-filled bag if you don't have a sandbag.